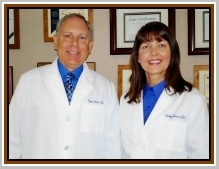 Rancho Cucamonga dentists, Thomas W. Mercer, DDS, and Shirley D. Mercer, DDS, are a husband and wife team that have been serving the Rancho Cucamonga area with a family-oriented cosmetic dental practice since 1985. When you visit our Rancho Cucamonga dental office, your smile is our top priority. Drs. Thomas and Shirley Mercer and our entire team are dedicated to providing you with the personalized, gentle care that you deserve. We are a comprehensive care dental office in Rancho Cucamonga and see patients from age 3 to 103. In addition to the gentle dental care you will receive, we are an affordable dentist so it is gentler on your wallet as well! Our practice is laser certified, Invisalign certified, and ZOOM! Whitening certified. We offer every treatment from simple cleanings and checkup exams to more complex procedures like root canals, cosmetic dentistry, and laser dentistry. Our patients enjoy the comfort and convenience of only having to go to one dentist in Rancho Cucamonga to get the treatment they want and deserve. At our Rancho Cucamonga dental office we use the finest materials and latest techniques to give patients beautiful healthy smiles in a relaxed, caring atmosphere. We have nitrous oxide (laughing gas) for the fearful patients. Many times the laser can be used to do fillings with no shot and no drill. All our fillings and crowns are tooth-colored and contain no mercury. Contact Us (909) 980-5558 or Schedule You Appointment Online Today! Rancho Cucamonga dentists, Thomas W. Mercer, DDS, and Shirley D. Mercer, DDS, are a husband and wife team offering family & cosmetic dentistry since 1985. Proudly serving Rancho Cucamonga, Alta Loma, Etiwanda, Upland, Ontario, Fontana and Rialto.